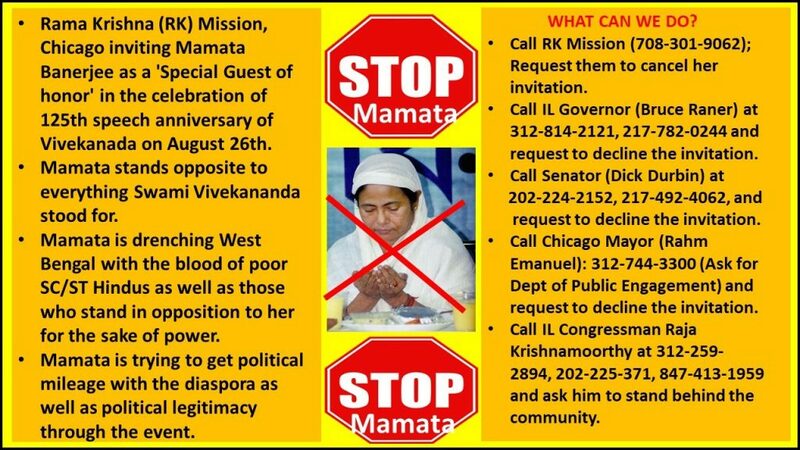 Rama Krishna (RK) Mission, Chicago inviting Mamata Banerjee as a ‘Special Guest of honor’ in the celebration of 125th speech anniversary of Vivekanada on August 26th. Mamata stands opposite to everything Swami Vivekananda stood for. The event will be held at Chicago Arts Institute, the very place where Swami Vivekananda spoke in 1893. Apparently, Illinois State Governor, Senator and Chicago Mayor are also invited to grace the occasion. Mamata is drenching West Bengal with the blood of poor SC/ST Hindus as well as those who stand in opposition to her for the sake of power. Mamata is trying to get political mileage with the diaspora as well as political legitimacy through the event. See this presentation on the atrocities during her regime. and tell them you disapprove of their choice of Mamata and cancel her invitation. Hindus across the world humbly request you to cancel the appearance of Mamta Beenarjee in the celebration of 125th speech anniversary of Vivekanada on August 26th in Chicago. Mamata Banerjee has a long history of human rights violations against the Hindu community as well as her political opponents. The Hindus across the world are deeply outraged over the news about her being a guest of honor for the historic 125th speech anniversary of Swami Vivekananda. Swami Vivekananda and the venue of his historic speech are sacred to one billion Hindus and honoring Mamata at this event is completely inappropriate. If the event happens with Mamata, the Hindu community and human rights activists will be protesting outside of the event rather than celebrating the event inside! It will be shameful for the whole Hindu community and the RK Mission. and request them to decline invitation to Aug 24th event in Chicago by Vivekananda Vedanta Society of Chicago (see email message below on what to say when you call them). Copy/paste the following email ids for the Governor, Senator, and Mayor and congressman. Subject Line: Request to decline the invitation of August 26th by the Vivekananda Vedanta Society of Chicago. 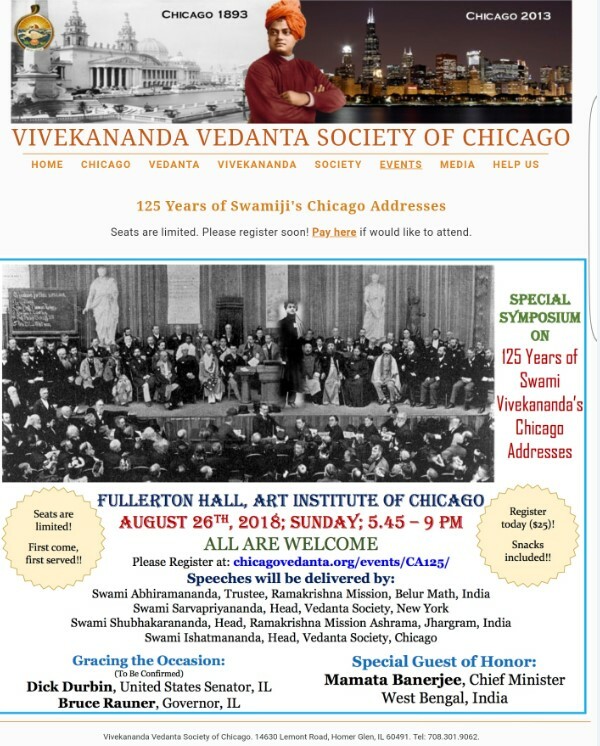 Hindu Americans of Illinois would humbly request you to decline the event invitation of August 26th by the Vivekananda Vedanta Society of Chicago. The organizing committee of the event is inviting Mamata Banerjee, Chief Minister of the state of West Bengal (equivalent to a Governor in United States), India as the Guest of Honor. Mamata Banerjee has a long history of human rights violations against the Hindu community as well as her political opponents. The Hindu Americans across the world is deeply outraged over the news about her sharing the stage with you for her to get political mileage with the diaspora as well as political legitimacy in her own state. We have also apprised this matter with Congressman Raja Krishnamoorty who is in agreement with this sentiment of the community. Nitish Kumar: India’s Man from Hope?